Finding the right freelancer is crucial to the success of your efforts to use social media for your business. Get the right one for you and your business and you should save time and effort to work on your core business, and get yourself a solid social media presence to use as you see fit. Get the wrong one, and PR disasters are there lurking in the background to do all kinds of untold damage. So how do you get hold of a good one? I used to be in printing. I spent all day translating customer job specs into one which the production department could use, and to give the customer an idea of what they’re getting for their money. I was an estimator. I did this for eight years in companies of various sizes in different parts of the UK. When a customer sent me a brief they had a fair old idea of what they wanted. Was it a brochure, or a poster, or a full set of stationery? Was it to be in full colour, or just black and white? How many pages did they need? What sort of quantity did they have in mind? Yes, they may have been flexible on the type of paper and open to my suggestions. They may have been open to having a few more printed depending on the price. But overall, they knew(ish) what they needed to get the job done. More importantly, while I was happy to quote a few different variations on their brief to help get best value for money, it meant I had somewhere to start. It meant I wasn’t proposing a full-colour glossy brochure, while someone else was pricing up a black and white poster. It meant we could be compared to other printing companies and the customer could make sure they were happy that the company they placed the job with, was the best one to meet their needs at the time. Why do buyers who place job specs for social media jobs think that being as vague as possible is helping to get the best value? This week, I was in contact with a potential customer for social media marketing who was a bit vague (to say the least). I asked for more info about what they did, what sort of budget they had for the job, and most importantly, what networks they were considering using. Their answer? All of them. What does ‘all of them’ mean to you? For someone who doesn’t use social media, probably they mean Twitter and Facebook, and maybe LinkedIn. Who knows? For someone like me who uses a heck of a lot more on a daily basis, not just for me but for my clients, this means something else entirely. It’s like the printing equivalent of saying ‘a year’s worth maybe’ when you ask about the quantity. So did I get back to the potential customer? No I didn’t. Maybe I would do well to stick it out and jump through the hoops that others wouldn’t to win the work. It sometimes worked in printing – you take on that nervous, clueless client and it pays off when you get all of their work for the rest of eternity. Sometimes. Other times you were left wondering how you did all that pitching and helping them out for it to come to nothing, or just to get stuck with all the complicated work that no-one else wanted. It doesn’t make good business sense for me to spend time pitching for work when I have existing clients to look after who better deserve my time. I appreciate that social media is a growing area that people maybe don’t understand so well. I get that. I get that maybe you really don’t know that saying ‘all of them’ is like asking how long a piece of string is. But I don’t understand how the perfectly reasonable question I asked couldn’t be answered….. I can’t help feeling that this client has been another bullet I’ve dodged. If they’re like this and we haven’t even got to the estimate stage, can you imagine what they’ll be like to work with going forward? What you do and what you’re looking to achieve through social media. What networks you are currently running or are thinking about running. Supplying links to any social media you have currently would be useful. How many hours a week you envisage this taking, or how much budget you have allocated. More information is better than less. I often dodge those jobs that don’t fit my knowledge areas or skills. That’s fine with me, and surely better for you to get fewer pitches but from more suitable candidates than a lot of pitches from less suited candidates. If you really don’t have a clue about this, then what you need is a social media consultant to draw you up a social media strategy, which a social media manager can then implement. But if you think that a social media manager will prepare a social media strategy from scratch for free, then you are probably mistaken. Some will. Some are too busy. Preparing a social media strategy is something which is a chargeable service in itself. In printing, estimates were usually free. Estimating was a necessary evil as no estimate meant a customer couldn’t even consider giving your company the work. But print estimates generally take a lot less time than writing a full social media management proposal from scratch with no information. Indeed it can take me a full day sometimes to create one. Why would I do it for free with no clue as to if you can even afford to pay for the ongoing work at the end of it? You want to give me hundreds of pounds a month on an ongoing basis? Then I’ll do you a strategy at the beginning, no problem. Don’t know what you want or if you can afford it? Then you won’t mind if I let someone else pitch instead. As in printing, if you were vague then I couldn’t help. In social media management, same applies I’m afraid. 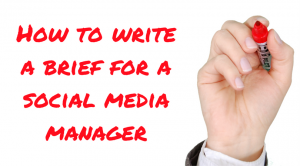 « So you want to be a social media manager?